This is our Ravensara Steam Distilled Essential Oil. 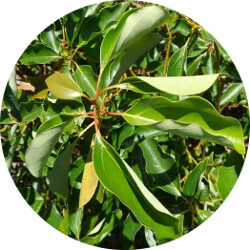 Herbal Folk Traditional uses for Ravensara include allergies, antibacterial, anti-fungal, anti-infectious, antiseptic, antiviral, cold remedy, cold sores, diuretic, pain relief, respiratory imbalances, sore muscles, shingles and toothache. Ravensara Essential Oil is beneficial for so many immune imbalances that are lung as well as muscle and joint related! It has a scent that is sweet, fresh, diffusive, mild lemony and cineolic, with an earthy, herbaceous and slightly medicinal undertone. Ravensara Essential Oil blends well with Bergamot, Black Pepper, Cardamom, Cedarwood, Chamomile, Clary Sage, Coriander, Cypress, Eucalyptus, Fennel, Frankincense, Geranium, Ginger, Grapefruit, Laurel Leaf, Lavender, Lemon, Mandarin, Marjoram, Palmarosa, Pine, Rosemary, Sandalwood, Tea Tree and Thyme. Ravensara Essential Oil is a "blend" all its own that benefits the sinuses and respiratory system by inhalation. Ravensara Essential Oil has the following benefits: anti-infectious, bacterial, reno-pharyngitis, gripe, bronchitis, viral hepatitis, intestinal viruses, cholera, herpes 1+2, mono, insomnia, muscle fatigue. Ravensara Essential Oil has the following actions: antibacterial, anti-infectious, antiseptic, antiviral, analgesic, antiallergic, antidepressant, anti-inflammatory, antioxidant, antispasmodic, anti-tumor, aphrodisiac, bactericidal, carminative, expectorant and immune booster.